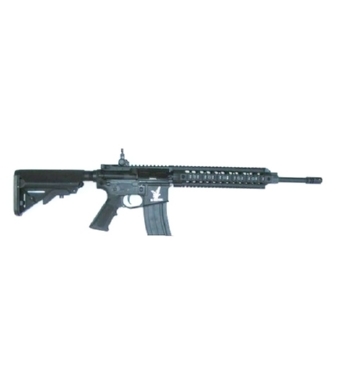 PRODOTTO DALLA JS TACTICAL, FUCILE ELETTRICO III GENERAZIONE MODELLO M4 RIS CQB L MARINE EAGLE UP. BATTERIA IN DOTAZIONE CQB 9,6V 1200mAh, CARICA BATTERIA 220V 300mA. GUSCIO IN METALLO CON LOGO SERIGRAFATO, CALCIO CRANE RETRATTILE, 5 SLITTE PER IL FISSAGGIO DI ACCESSORI, TACCHE DI MIRA RIMOVIBILI.